In 1986, you could drive down Fremont St at night and see the black sky illuminated by the neon of the casinos, unfettered by a large canopy experience. In 1986, the Sands was considered center strip. You could enjoy gaming north of it at the Desert Inn, the 2nd El Rancho ever to grace the strip as well as Silver City, Silver Slipper, Westward Ho and Bob Stupak’s Vegas World. 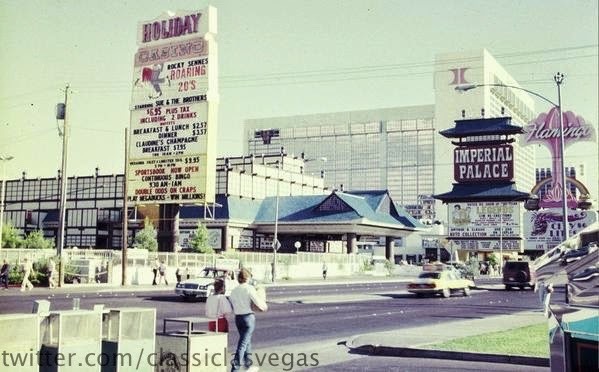 You could also visit a an Imperial Palace who actually utilized the Asian themed building on the strip as part opposed to having it be the giant storage facility you had to walk past to get into the property. This week’s winner comes to us from @classiclasvegas for sharing that time almost 30 years ago.